I hate it when I completely forget about a recipe that we love. I used to make this pasta almost once a week, because it was so easy, inexpensive, and delicious. It’s one of Justin’s favorites, and I think that has to do with the lemon juice and the feta. I think this recipe was originally adapted from Cooking Light magazine, and it was actually a shrimp dish. And it probably had different pasta. Anyhow, here’s my version. Cook pasta in salted boiling water according to package directions. Drain and keep warm. Meanwhile, heat olive oil in a large skillet over medium heat. Add garlic and saute 1 minute; add tomatoes, parsley, lemon juice, salt, and pepper and simmer 10 minutes. 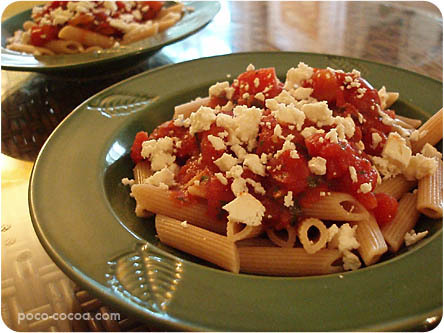 Spoon tomato sauce over pasta and sprinkle with feta. awesome! i’m making this tonight…a rare occassion when i find a recipe online and i’ve got everything in the ingredient list. yum. I love it when the recipes are this easy and so good. I will try this. I link to you on my food blog and my rantings blog. Love your stuff. I think I might be making this tonight! I just happened to pick up feta at the store this week.